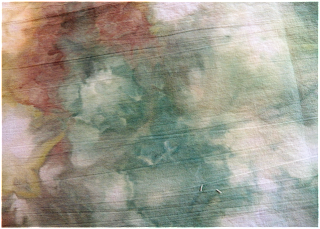 Remember the fabric I ice dyed a couple of weeks ago? 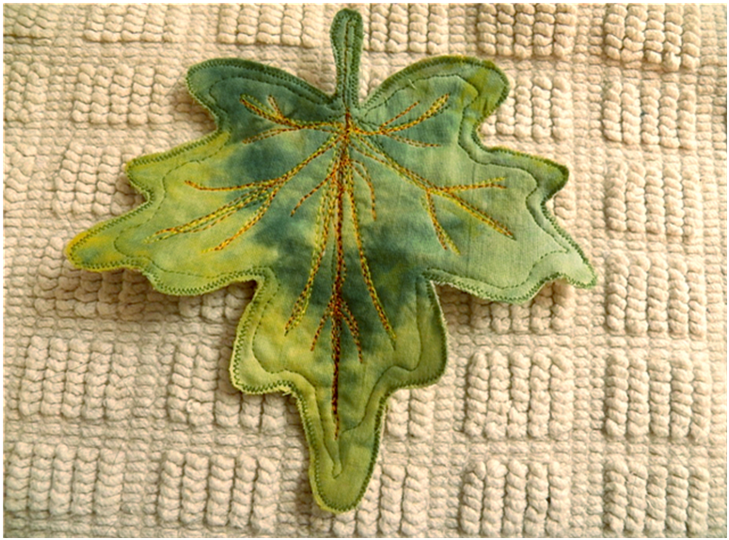 I used it for a leaf art project that I'm using for coasters! Everyone thinks of Phoenix as having dry heat and that's true for the first part of summer. But when the monsoon flow comes up from Mexico, starting around the first part of July, it can feel like Dagobah from Star Wars! Usually no one's that worried about using coasters because glasses don't sweat - until monsoon and then they pour. I've tried several different types of coasters, but none do a good job of keeping all that water soaked up. I have high hopes for these! Plus they're washable and reversible. 1. 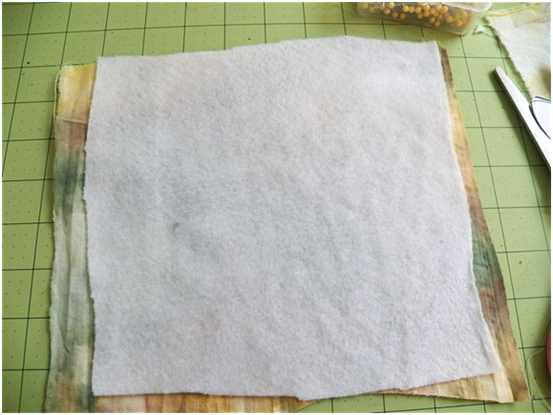 With an iron, lightly attach a piece of fusible felt to the back of your fabric. Don't attach it securely yet - we'll be pulling up the edges in a couple steps. 2. 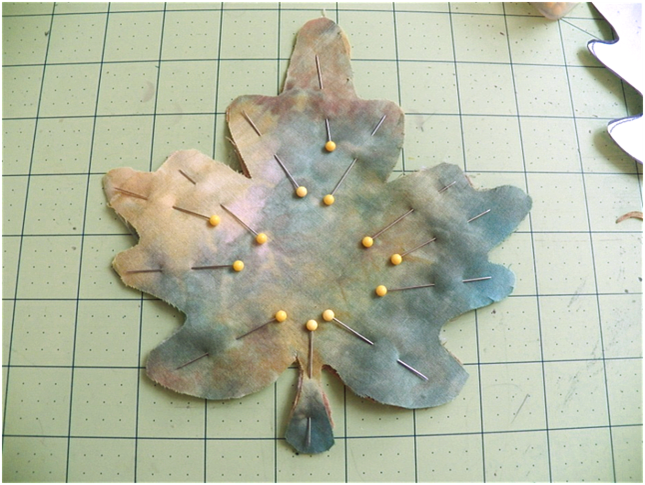 Pin the cut out leaf pattern to the felt/fabric combination and cut out. 3. 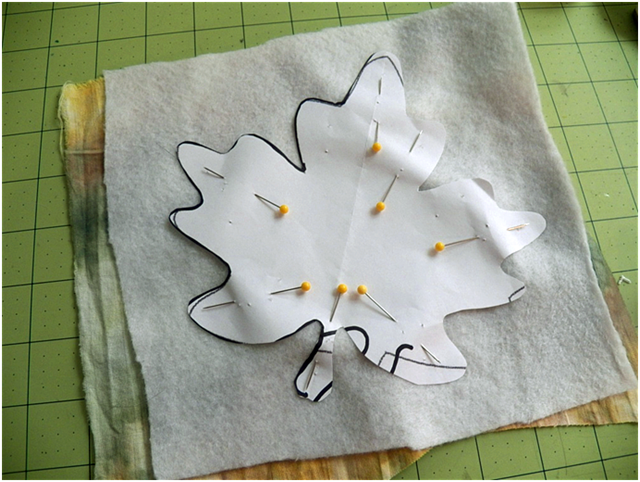 Pull the felt away from the edges of the leaf and trim off about 1/8 inch. 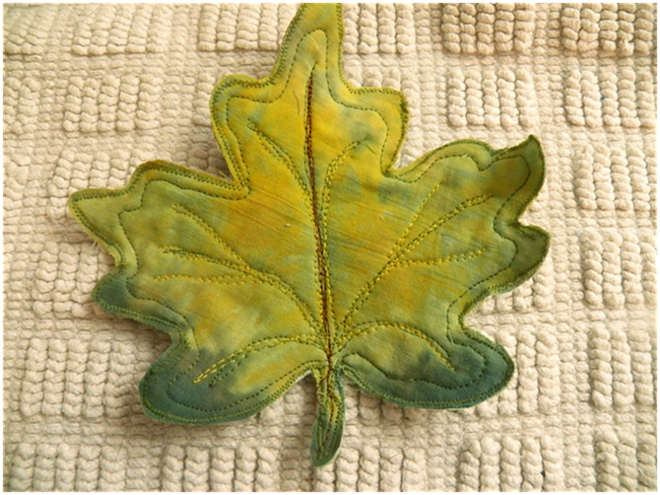 This is so the felt won't poke out the edges when we sew around the leaf. When you're finished, iron to attach the felt firmly. 4. 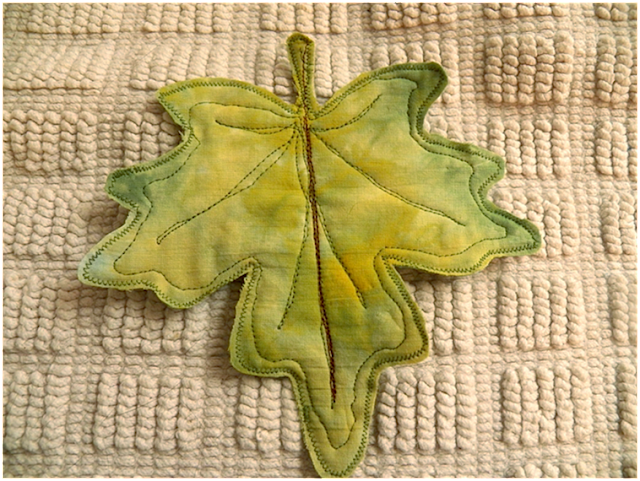 Cut another leaf shape from your fabric and pin it to the felt/fabric combination. 5. Using a very small zigzag stitch, sew around the edges of the leaf. Trim close to the stitching. 6. Now comes the fun part! 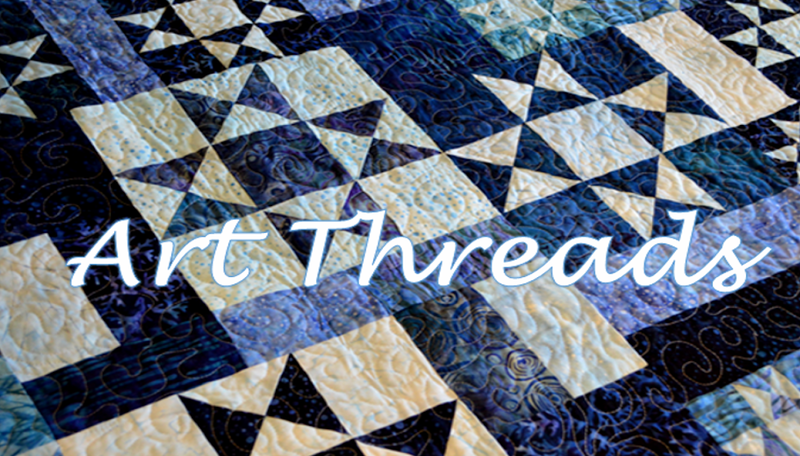 Put the feed dogs on your machine down, put on the free motion quilting foot and thread sketch leaf veins. If you haven't tried this before, see this past post. It'll point you to a couple of tutorials. 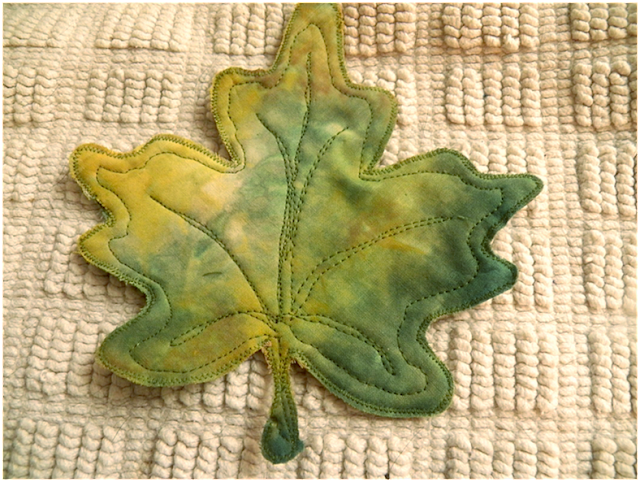 First I went around the outside of each leaf and then sketched in some veins in green thread. 7. Next I made a thick vein in the center from brown. 8. I then added bright highlights with golden yellow thread. 9. And finally I added a few new veins with copper thread and then highlighted a few of the other veins with it. These were inspired by summer leaves - I think I might need to make some autumn leaves too! Really beautiful, Aunt Debbi...will have to try some of these, they look fun to make! 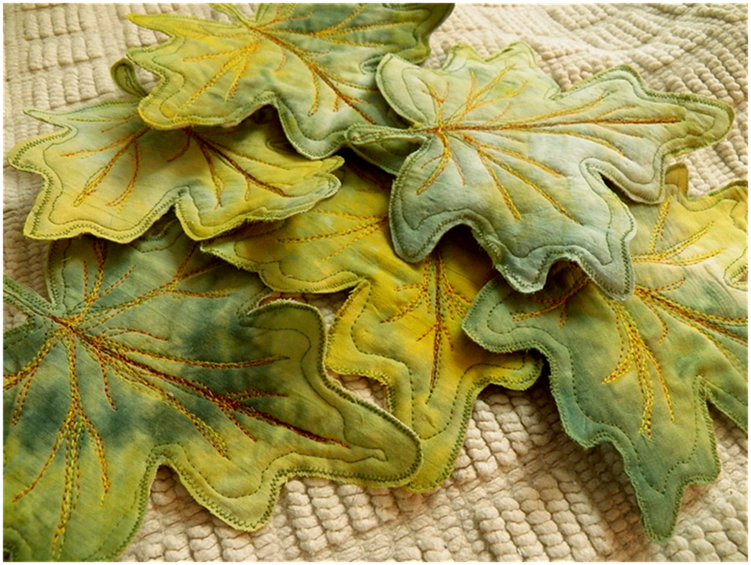 Credit goes to you for the inspiration of my post project today @ http://joysjotsshots.blogspot.com/2013/10/fall-fabric-leaves-leaf-coasters.html . Thank-you! I made 27 leaf coasters for our Church's Ladies' day to be held next Sat. The Bible verse will be the theme of the day. Thank you for sharing this. So timely for fall table runners and placements and coasters that match. Monday Project - Tie Dye Meets Ice Dye!